Police upped security Wednesday in front of government buildings in Catalonia and provided special protection for several political leaders, judges and prosecutors as further pro-independence protests loom, authorities said. Separatist activists have in the past weeks taken advantage of the void left by a renewed crackdown on the restive region’s independence movement to step up their protests by blocking roads and clashing with police, raising fears of radicalisation. 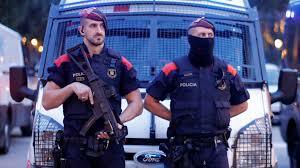 “From today (Wednesday) we are implementing a new plan to guarantee security and public order with regards to the various scenarios that could take place in Catalonia,” a spokeswoman for the Mossos d’Esquadra, Catalonia’s police force, told AFP, without giving further details. Enric Millo, the central government’s representative in Catalonia, added that “security measures have been increased for people and public equipment that have been targeted by protests, graffiti or assaults recently”. The central government’s representative office said security would be upped particularly in front of its buildings in Catalonia, as well as European institutions. Several political leaders, judges and prosecutors will also be given special protection, it added, without saying who. Judge Pablo Llarena of the Supreme Court, who is in charge of proceedings against separatist leaders, is already under protection after having received threats, the interior ministry has said. Millo said these measures were implemented due to “an increase in belligerence” in the past weeks as separatists have protested against the jailing of more pro-independence leaders in Spain and the detention of former Catalan leader Carles Puigdemont in Germany. Puigdemont faces extradition to Spain after a failed bid to secede last October that saw Madrid take Catalonia’s autonomy away and impose direct rule. The protests were called by the Committees for the Defence of the Republic, groups of pro-independence activists spread out across the region. In Barcelona, some protesters tried to occupy the central government’s representative office, heavily guarded by police, on several occasions at the end of March, leaving more than 100 people injured. In a joint statement last week, these groups said “the Catalan spring” had “erupted,” in reference to a series of protests which began in Arab nations in 2011.